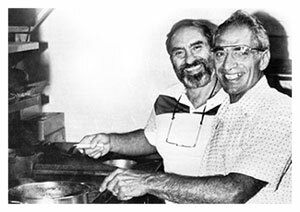 On August 6, 1957 brothers Frank Incorvaia Sr. and John Incorvaia Sr. opened INKY'S on Detroit Avenue south of Sylvania Avenue. In 1985 an addition to the original building a side dining area was added to accommodate the overflow of people who "just keep coming back." Change does not come easily at INKY'S. From the INKY'S main sign that has remained unchanged for over 50 years to the secret family recipes from the pizzas and entrees. People recognize good food and after over 50 years of service INKY'S has become a Toledo icon. Maybe because our business is family owned and operated it is a step above the rest. Frank Jr. and Keith Incorvaia began running INKY'S when their fathers retired. A third generation is being groomed for their retirement. Maybe it is the concern for our customers that makes INKY'S so special or maybe because people know that when you're at INKY'S you're treated like part of the family. For customers and owners alike, INKY'S is a rewarding Toledo institution.